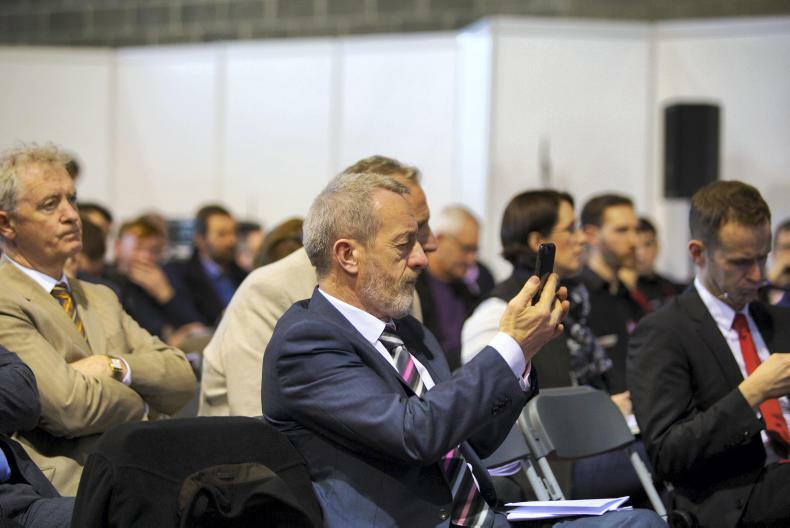 Farmers with forestry offer the greatest potential to fuel the emerging bioenergy industry showcased at this Tuesday's Energy in Agriculture event, writes IFA forestry executive Geraldine O'Sullivan. Forestry thinning at Roundwood, Co Wicklow. Approximately 40% of the total forest area in Ireland is owned and managed by farmers, with the majority of plantations reaching production in the coming decade. Forecasts show that timber production is to grow from 3.1 million m3 in 2017 to 7.9 million m3 by 2035, with almost all of the increased volume coming from farmers. The mobilisation of this resource is not without significant challenges. Many factors influence a farmer’s decision to harvest these, including the size of the forest, the level of bureaucracy, lack of knowledge, investment in infrastructure, available harvesting technologies, transportation, etc. The IFA’s five-point plan to revitalise the farm forestry sector emphasised the importance of producer organisations to overcome some of the barriers to mobilisation. The peer-to-peer support offered by producer organisations has proven to be hugely successful in mobilising private sector resource elsewhere in Europe. 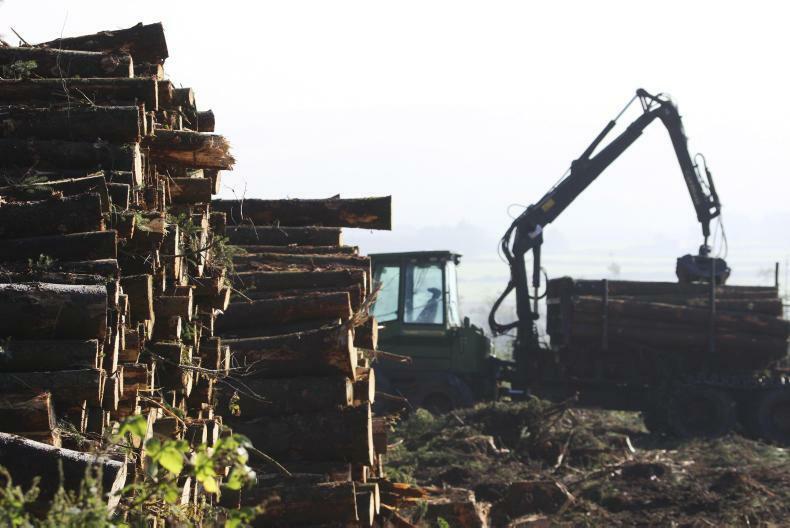 The IFA’s budget 2019 submission is looking for the introduction of supports for existing forest producer groups to help them create the necessary scale to optimise efficiencies in the supply chain and ensure the long-term sustainability of the group and supply. Properly functioning forest producer organisations are the key to improving efficiency and building further capacity within the sector to satisfy the growing demand for biomass and ensure the long-term sustainability of the sector. If bioenergy generation is to become widespread, then biomass must be readily available and cost-competitive. Currently in Ireland, the biomass market is informal and often supply and demand do not easily match. To ensure an uninterrupted supply, as well as greater control in fuel quality, the IFA advocates a network of centralised biomass trading centre regional service stations that supply top-quality wood fuels, operated by forest producer organisations. A centralised system would enable improved control of the procurement process. Biomass could be stored at the centre and processed during the winter season when the demand for fuel is high and working conditions at the forest may be more difficult. Supporting the establishment of the network of biomass trade and logistic centres offers farmers and rural communities significant new business opportunities to not just supply biomass, but to become heat contractors. 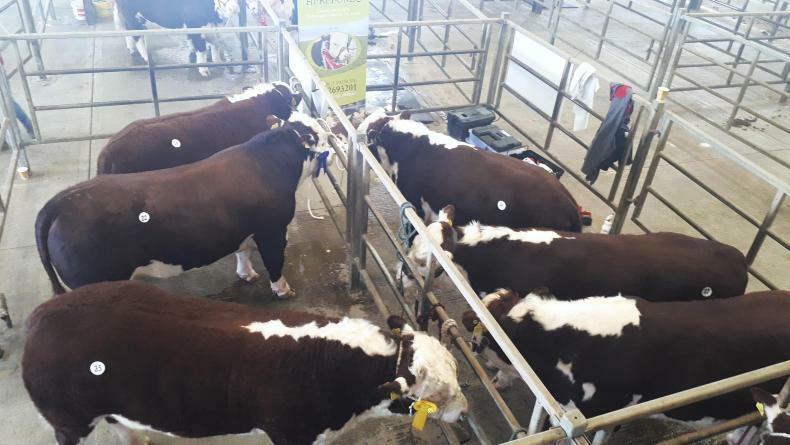 It was tough going for auctioneer Hugh Mulvihill to find buyers willing to pay more than €2,000 at the Hereford Spring Show and Sale in Nenagh on Saturday. In the first hour of selling, only seven bulls sold, with a top price of €2,650 for a July 2017 bull, Corran Hill Email. The dry day and sunshine didn’t help buyer activity, with most farmers very busy getting fertiliser out, grass seeds in and calves dehorned. Overall Hereford Champion went to Ballinveney Utube for Rory Farrell, Toomevara, Nenagh, Co Tipperary. Utube is a son of Steil Gerard and out of a homebred cow Ballineveney Pier. Born on 20 October 2017, the champion had a terminal index of €46 and replacement index of €30. The bull went unsold the first time through the ring at €2,900. Lot 16, Clooncullane Captain for Coman Neary, Strokestown, Co Roscommon, was Reserve Champion. The September 2017-born bull was sired by Kilsunny Goliath out of a homebred dam Clooncullane Duchess. Rating €40 for terminal and €41 for replacement, the bull went unsold through the ring at the first attempt making €2,450. Full sale report in print in next week's Irish Farmers Journal. Sign up to the Withdrawal Agreement, move for a general election or have another referendum on Brexit were the three options MEP Sean Kelly sees as the options for the UK following this week’s Brexit extension. Addressing the audience at the Clare IFA dairy seminar in Ennis on Thursday night, Sean explained how sick and tired most members of the European Parliament were with Brexit and the negative influence it was already having on dairy and beef farms in Ireland and beyond. IFA members in the audience talked about the hurdles Irish and European farmers have to get over in order to secure markets abroad. Sean agreed, but also suggested that environment and climate change must be addressed by farmers and that Ireland, including the farming community, need to reach the 2030 climate change targets. Members of the audience pushed Sean to campaign for farmers to help with getting the Fair Deal scheme eligibility across the line. The IFA is organising a protest on Fair Deal in Dublin next Tuesday. Breeding for improved health traits will be the next big drive at farm level for Irish dairy farmers to achieve even more progress to address climate change concerns, according to Teagasc's Donagh Berry. Speaking at an IFA Clare dairy seminar in Ennis on Thursday night, Berry spelled out the shortcomings and future challenges with breeding in Ireland. He said: “The EBI index for selecting better cows and sires is working. However, it’s only running at a fraction, about 33%, of what it could be delivering. 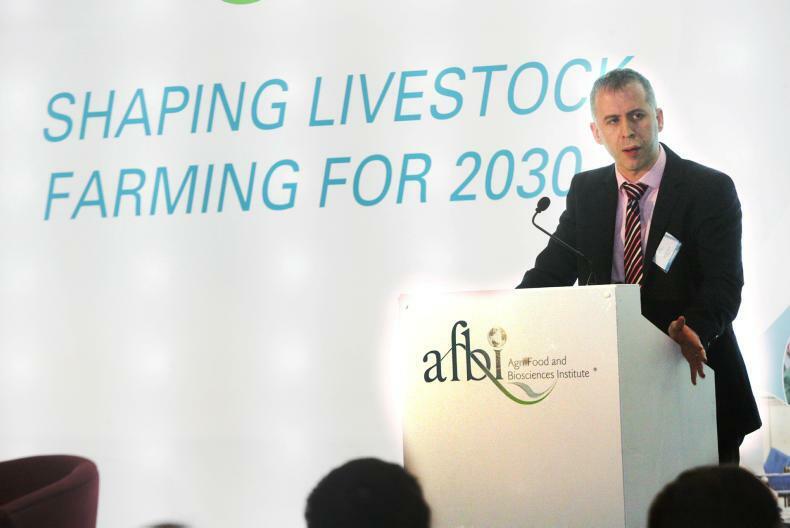 Donagh explained that the next big focus needs to be on delivering animals that last longer in herds. Yes, better fertility, better management, and better health traits feed into this, but Berry believes this will also be one of the solutions to the livestock climate challenge. “If we can get milking cows to live for an additional 1.5 years, then it dilutes all the environmental challenges. "When we compared the cow milking in 2001 with a cow milking in 2014, that cow was 13% more carbon efficient. Berry believes dairy farmers will select between sires for TB resistance, the same way they select for fat and protein at the moment, depending on the prevalence of the disease in their particular area and disease history.